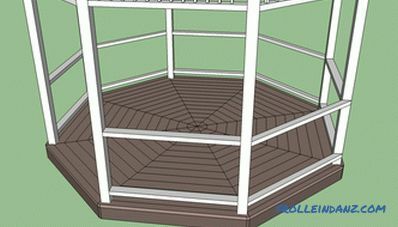 This step-by-step instruction is intended for those who decide with their own hands to make an open octagonal wooden arbor. If you have a large garden and you want to personally participate in its design, we recommend that you think about creating such an arbor. 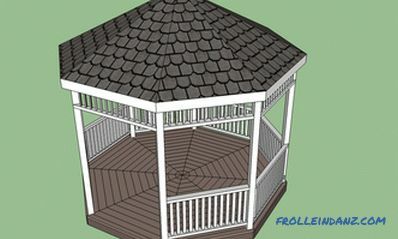 The octagonal pergola can transform the look of your suburban area. This is a great place for solitude or for a family lunch on a hot summer day. Just imagine yourself in the gazebo, reading a book and watching children who are having fun in the garden. 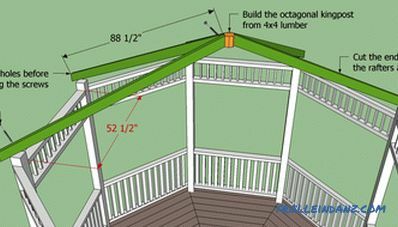 Building such an arbor is a simple project, but provided you have some woodworking skills, use the right tools and materials and you have a clear work plan. Our step-by-step instruction will help you cope with this task. 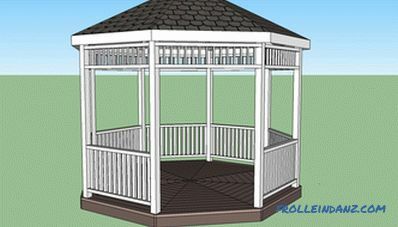 Proper arrangement of an open gazebo is a very important aspect, and you should pay close attention to it, otherwise you will not be able to fully enjoy all the benefits of your construction. In addition, we advise you to make sure that the construction you started does not violate any legal regulations. Building an arbor is a great opportunity not only to improve the look of your garden, but also to improve your carpentry skills. 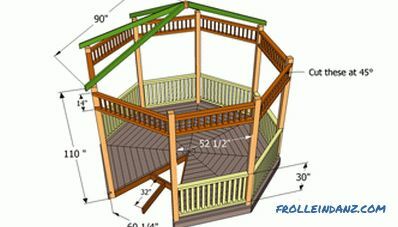 Carefully plan everything from the very beginning, starting with the size of the gazebo and ending with the necessary materials. As in the case of any other project related to woodworking, you must be extremely accurate when taking measurements, otherwise you will either spend extra money due to the lumber rejected as a result of your carelessness, or the appearance of your building will be too far from ideal. It is very important to choose the right materials for the work, otherwise your open arbor will very soon become unusable under the influence of rain and snow. We recommend the use of mahogany, cedar or sawn timber treated with antifungal impregnation under pressure, as they are intended for use outdoors. Make sure you buy stainless steel fasteners, since ordinary screws and nails can cause rusting stains on the surfaces adjacent to them. F - Roofing material: 20 mm plywood, tiles; Protect nye gloves, goggles. 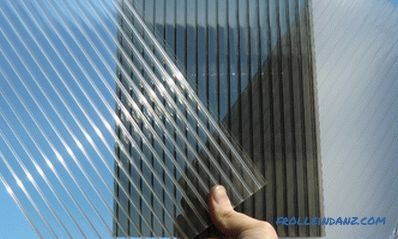 H - Balusters: bars 5 * 5 cm. I - Fasteners: nails or screws from 5 up to 10 cm. Before starting work, mark the contour of the future gazebo with the help of a rope stretched over a peg. Use adjustable anchors to fasten the racks. When installing racks, use a level that allows you to simultaneously control two directions. Use screws and stainless steel fasteners only. 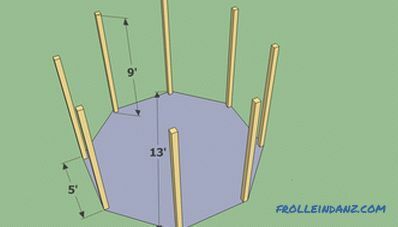 A drawing of an 8-sided arbor. First of all, you should decide on the location of the gazebo. To visualize the plan on the ground, we recommend using pegs and a rope stretched over them. To do this is actually easier than you might think at first. Think of an octagon as a square with cut corners. Use the "3-4-5" rule (according to the theorem, which everyone probably remembers from the school bench, the hypotenuse of a right triangle with 3 m and 4 m legs should be equal to 5 m (32 + 42 = 52)) to make sure that all the corners of the square are right. Do not forget to make sure that the diagonal shapes are equal. Various types of foundations can be considered suitable for a gazebo, starting with a concrete slab and ending with cant runners. The first option is ideal for permanent, fundamental constructions, the second is recommended if you want to move your building over time. 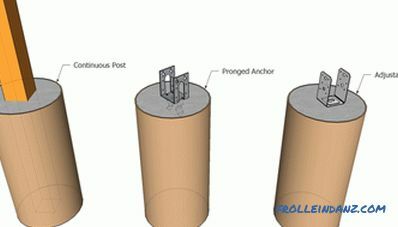 Wooden bars are placed on concrete pillars, as shown in the figure. The foundation of the gazebo. We advise you to dig holes with a depth of at least 60 cm (at least 7-15 cm below the freezing boundary of the ground), cover and tamp the 7 cm layer of gravel and install a tubular formwork. Then you should prepare a small amount of concrete and fill out forms with it, without forgetting to install adjustable anchors. Use a ruler and spirit level to make sure the foundation is even. Fixing the rack on a concrete foundation. Before fixing the pillars, align them vertically, using a spirit level, and fix in two directions until the concrete hardens. It is important to fix the rack properly, otherwise the gazebo will not be too reliable. Vertical alignment and securing of wooden pillars. To ensure that all the racks are on the same level, use an adjustable anchor for mounting them - this is the optimal solution to this problem. 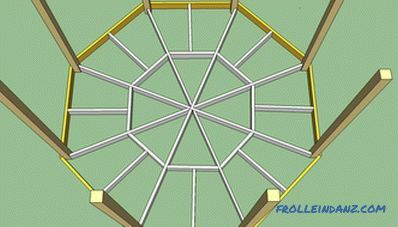 The layout of the octahedral arbor racks. It is not difficult to make the floor of the arbor if you use the right plan. To begin, you have to lay the floor lags 5 * 15 cm, as shown in the figure. Use metal clamps to attach the lag in the desired position. If you do not have a suitable fastener, simply hammer the nails at an angle, pre-drilled the guide holes. 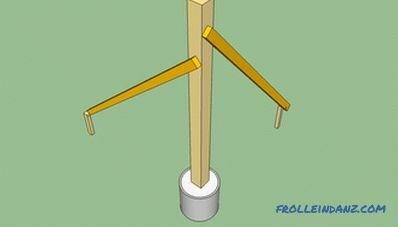 Tip: Place a concrete support in the center of the arbor that can support the weight of the floor. 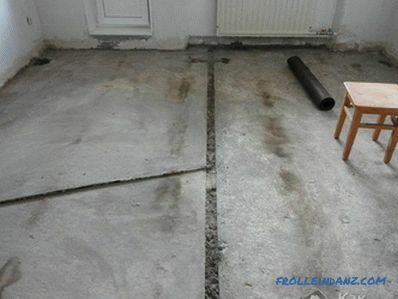 The use of the level will guarantee a strict horizontal floor. 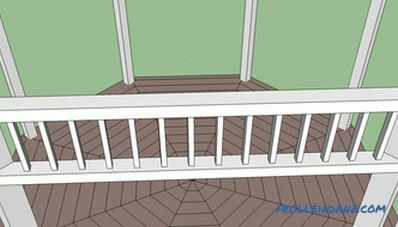 Basic lag overlap is not enough to hold the flooring, so we recommend that you make the bottom trim, and fix the cross-beams in the middle of the main beams, as shown in the figure. Tip: Drill the guide holes in the structural elements before screwing in the self-tapping screws to prevent the wood from splitting. Use metal brackets to connect the perpendicular bars between them. Now the floor frame has to be covered with boards. 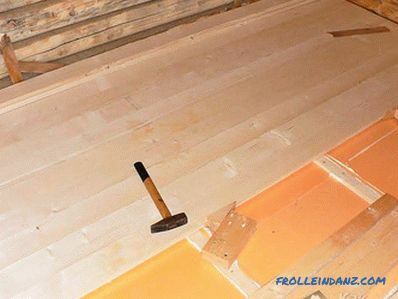 Attach each end of the floorboard with two nails / screws. 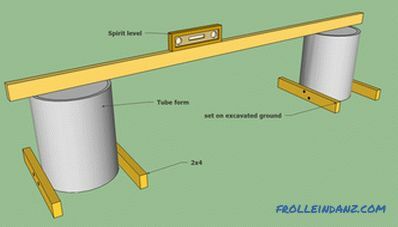 Remember that the joint of the planks must fall exactly on the middle of the carrier beam, as shown in the figure. Tip: First row boards should be bordered by wooden arbor racks. 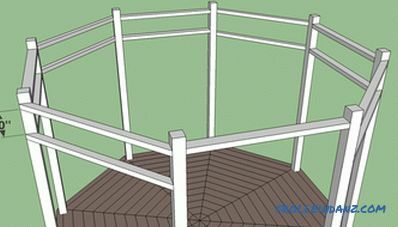 Leave a gap of 2–3 mm between the stacked boards to prevent water from accumulating on the floor of the gazebo. 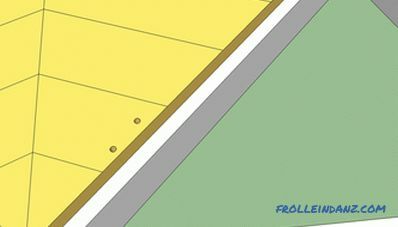 After you have laid the floor, create a frieze. This decorative element is not mandatory, but we strongly advise you not to abandon it if you want your gazebo to acquire a unique look. Tip: When designing a frieze, you should consider the design of the lower fence and the elements of nearby buildings, in particular your home. For the lower and upper guides of the frieze, use wooden bars 5 * 10 cm, and for balusters - 2. 5 * 2. 5 cm. Careful performance of work ensures that all elements fit perfectly in their place and will have a neat appearance. To fix balusters, you must hammer nails through the lower and upper rails. You can hammer nails into balusters and at an angle, but in this case do not forget to fill the holes with wood putty at the end of the work. To get the job done quickly and efficiently, we recommend that you assemble the frieze on the ground (of course, after performing accurate measurements), and then install it in place, securing its upper and lower guides on the uprights. The design of the frieze can be very diverse (variations in shapes, sizes, etc. are allowed), you should choose the one that best suits your needs and tastes. General view of the arbor frieze. Make blanks for rafters from 5 * 10 cm of bars, the ends of which are beveled at an angle of about 25 °. 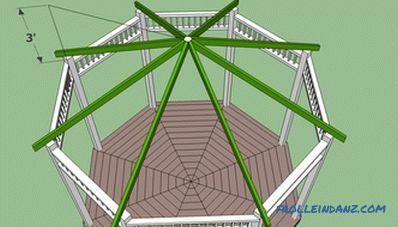 Install rafters in pairs - on racks opposite to the center of the gazebo. The rafters are fastened with 10 cm self-tapping screws. 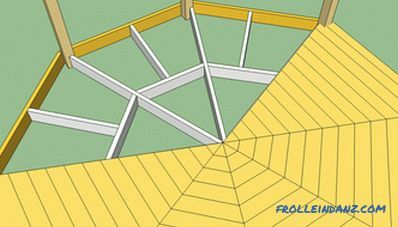 Drawing of the roof of an octahedral arbor. To fix the rafters in the center, at the point of their convergence, you will need a short octahedral bar, which can easily be made from a standard square bar of 10 * 10 cm. 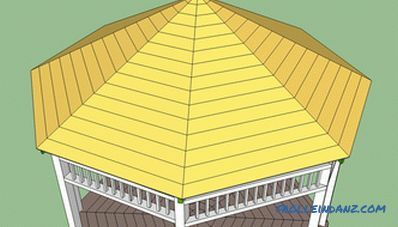 As you can see in the picture, the rafters should protrude beyond arbors on 15-25 cm. The frame of the roof is ready and now you can proceed to its covering with 20 mm plywood. Use a good circular saw to cut pieces of the required size (use a fine-tipped blade). Attach plywood to rafters 5 cm with screws every 15 cm. You can also use boards for roofing instead of plywood.If you choose this option, you can not lay the tile on top - just cover the surface with a composition that prevents the wood from rotting. After this stage is completed, you must cover the plywood with shingles. 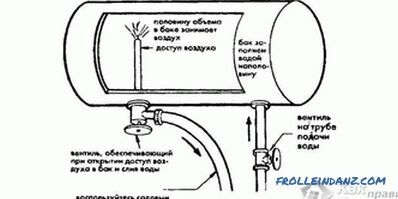 It is necessary to begin this work from the bottom of the roof after mounting the drip. 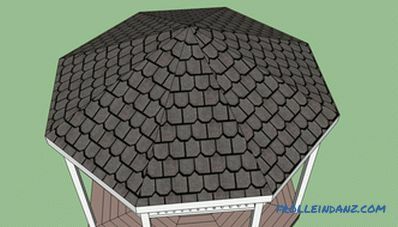 Mount the roofing shingles nails, retreating 2-3 cm from the edge. Pay particular attention to the installation of the ridge pattern, since poorly performed work in this case will lead to the fact that rainwater will sooner or later damage the base and the truss system. The roof is ready, it's the turn of the lower fencing. Like the top decorative frieze, the fence can be given a wide variety of shapes and sizes. You need to think about this issue in advance so that the outcome of your work will not disappoint you. First you need to install the lower guide, using for this purpose bars 5 * 10 cm. To fix them in the desired position, you can either screw in the screws at an angle of 10 cm, or use metal corner brackets. The upper guideline is made in the same way. 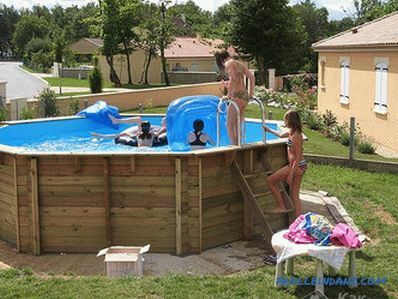 Install it at 70-80 cm above the bottom, however, the height of the fence depends solely on your needs and tastes. Tip: When installing the guides, be sure to use the spirit level, otherwise the pergola fencing will look sloppy. 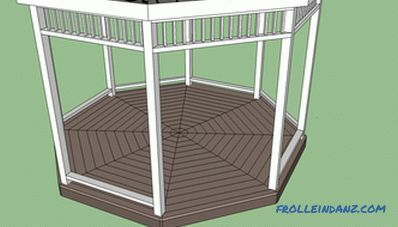 Upper guide of the gazebo. For making balusters, use bars of 5 * 5 cm. They should be placed every 5-10 cm. 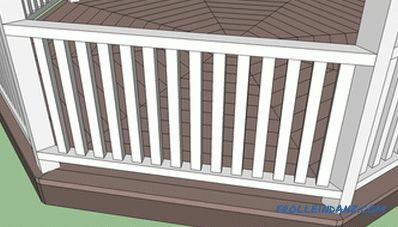 Of course, they must be evenly distributed (so that the distances between the balusters are the same, use the insert from the trimming bar). Instead of square bars, you can use wide railings as balusters, but remember that the design of the lower fence should match the design of the upper decorative frieze, otherwise the arbor will lack grace. 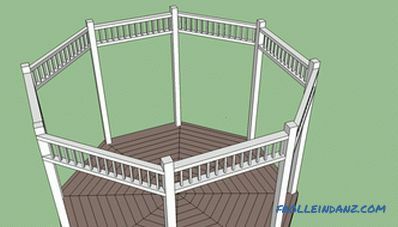 If you want your gazebo fence to look aesthetically pleasing, do not drive nails into the upper ends of the balusters through the railing - in this place it is better to use hidden connections, such as dowels. Upon completion of construction work, be sure to fill all extra holes with wood putty. Allow the composition to dry, then sand the wooden surfaces. Tip: To protect the arbor from decay, cover all wooden surfaces with several layers of wood stain. Be extremely careful and do not forget about common sense, this will allow you to avoid costly mistakes. Do your best, and then you can be proud of the octahedral arbor made with your own hands.